There are no universal answers in the world of acoustic sound treatment. The interpretation of sound resides within the individual hearing it, so even when a product meets technical performance specifications, it may not be meeting the needs or preferences of the individual. Music genres, instruments, and vocals also play a role in the treatment of sound because of the different frequencies in play. Even the layout and size of the room where recording or playback is done can have a major impact, perhaps the greatest one, on the effectiveness of treatment materials. 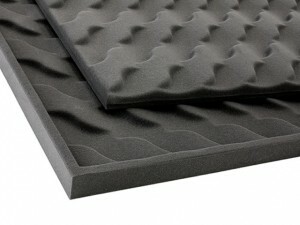 Because every space is unique and must be approached individually, The Foam Factory offers full customization of their acoustic foam sound deadening product line. 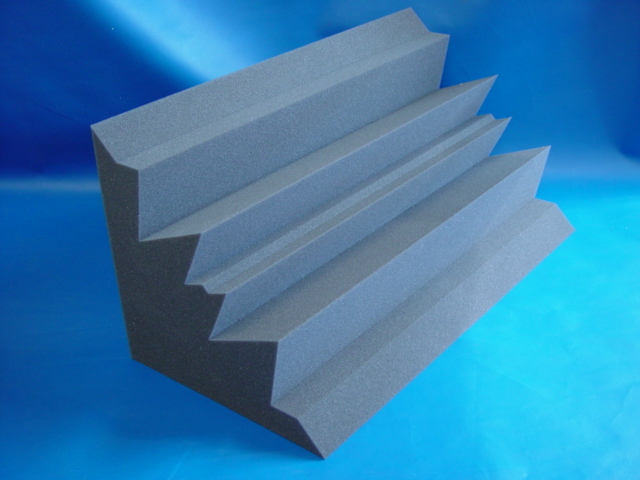 In addition to their standard acoustic offerings like corner bass traps for vibration dampening or drop ceiling tiles, The Foam Factory offers specialty products that can be customized to a customer’s exact requirements. One such product is the hanging foam baffle. Typically seen in large public or industrial spaces like auditoriums, gymnasiums, warehouses, and places of worship, baffles are hung from ceilings and help to reduce echoes and dampen the sound waves that bounce and reflect within cavernous structures. The larger an area is, the greater the potential for distracting noise. If you’ve ever attempted to enjoy a quiet lunch in a cafeteria, you’re well aware of this situation. Hanging baffles break up the bouncing echoes in large rooms, so the only sound you hear is the original message, not the reflection of a sound coming by a third or fourth time. Because they’re suspended away from people in open spaces, baffles are larger than most acoustical treatment products. A typical size for a two-sided baffle is 4 feet wide, 2 feet tall, and 3 inches thick. The larger the baffle, the more space it diffuses. These feature straps with grommets extending from the material’s corners so the baffle may be hung vertically or horizontally. The Foam Factory is able to manufacture baffles to this standard dimension or any other custom size to outfit your space. By gluing two sections of acoustical foam to either side of a fabric layer that supports the grommets, the foam itself doesn’t bear any of the product’s weight, preventing tearing or damage. Baffles can be made in thicknesses from 2 inches, all the way to 8 inches for the largest mountings. Styles are available in all of the patterns The Foam Factory offers for wall-mount acoustic tiles such as eggcrate, pyramid, and wedge. They also offer designs in their new Wave, Spade, and Grid panel patterns. All 12 colors are offered for the eggcrate, wedge, and pyramid, however charcoal is currently the only color offered in the new sound panel designs. For treating smaller spaces that don’t have the major sound issues baffles are designed to solve, the aforementioned wall-mount acoustical foam tiles are an excellent way to treat your space at multiple sound frequencies, eliminating echoes and increasing diffusion. Like baffles, acoustical tiles break up standing waves, clarifying sound and minimizing fluttering echoes. This is important for smaller spaces, as many feature square or rectangular rooms that can produce echoes and reverberation. Acoustic treatment foam can help improve a room’s sound in these situations and many others, and The Foam Factory’s Class A rated fire retardant foam tiles are perfect for the job. In addition to the tile patterns, The Foam Factory has just introduced three additional designer acoustical panels, created with compression cutting technology. The new Acoustic Grid, Acoustic Spade, and Acoustic Wave patterns incorporate design and performance into their noise deadening forms. Made in reciprocal pairs to optimize materials due to the nature of the cutting process, these larger panels, measuring 69 by 43 inches or 66 by 45 inches depending on edging, range from 1 to 4 inches in thickness. Pattern depth versus base thickness is customizable for these styles as well, by manipulating the amount of pressure applied to the foam during cutting. While many of their products are passive in nature like wall treatment, The Foam Factory also offers items that take a proactive approach in combating sound. One example is custom sound isolation pads for mic stands. Sound waves bounce around a room, but vibration generated from speakers, instruments, and foot-fall may travel through stands and muddle otherwise excellent recordings. Foam rubber isolators placed under the bases of these stands can absorb the vibrations that occur in studio or recording settings. The most basic style is a dense, closed-cell foam disc that goes under a stand’s feet to separate it from the floor. These are made of either cross-linked polyethylene (XLPE) foam or neoprene, in thicknesses from 1/4 of an inch for XLPE, or 1/8 of an inch for neoprene. Small pads can be cut to go under each individual foot of a stand, or mats can be made from a single piece of foam for a larger, one-piece base. Another option for stand isolation is open-cell charcoal foam. Unlike the disc pads, these can be made to wrap around the foot of a stand, helping them stay connected when moved across a room. If you’re in need of a unique product for a unique purpose, it can sometimes feel like your options are limited to choosing either performance or aesthetics. But with The Foam Factory’s sonic solutions, you have all the options you’ll need from both sides of that equation.